Pesky gates will not stop officials from accessing the scene of the crime with the help of the Tactical Gate Pass (2 piece set) from Zak Tools. When investigating private property, large gates can become cumbersome annoyances that slow down the entire investigative process. Heavy doors swing shut, hit cars and create other problems that distract officers from the problem at hand. 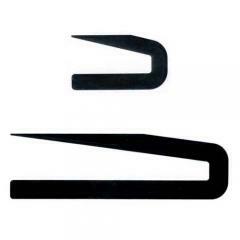 The 2-piece pass system features dual steel spikes shape to keep those gates secured in one place. The stake is curved, allowing the user to hook it over the bottom rung of the gate and drive it into the ground like a giant staple. It can also be hammered down in front of gate doors to function as a large doorstop. I love these items. They have been usefull while being on patrol and while serving warrants.